Passionate about painting with acrylics? Need a monthly fix chock full of inspiration? Need some help to take the pain out of your painting process? It's all here for you. Acrylics Anonymous. Zero elitism. Dive in. If you enjoy Acrylics Anonymous, and you know someone who might also enjoy it, you can share by forwarding it to your friends! If you are receiving this because a friend has forwarded this to you, and you would like to subscribe, click here! Every month, we will produce a Subscribers Only "sealed section". 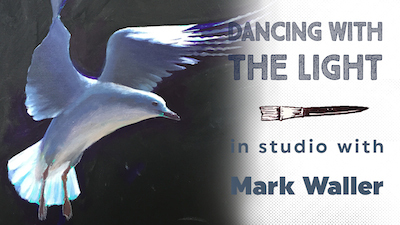 It could be a painting technique, a short video tip, or anything we can think of that we reckon you might enjoy. Please let us know what you think, we love your feedback! To leave comments, contact us here. When painting anything, I always look for at least 3 sources of light. By this I mean, direct light (the sun for example), reflected light from the sky (for example a bit of blue) and reflected light bouncing from other objects (for example the sand underneath a tree). 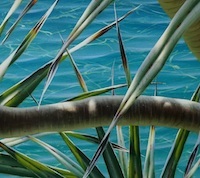 Gain a new perspective with all the info on painting an aerial landscape, in our latest web page! A little reminder to check out our How To Paint Trees tutorial page for some great tips to improve your tree painting process. Every month, we choose an Artist from our forum to showcase. You can even nominate someone if you like. (Or yourself!). To do this, check out the forum and then send us an email! It’s that easy. 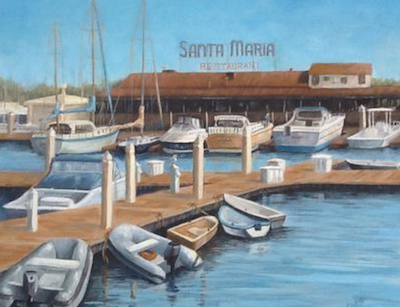 This month we’re focussed on artist Linda Shelton from Orlando, Florida, with her painting, “Docked For Dinner”. Linda has done an inspiring job recreating those reflections! Excellent job Linda! Read more about Linda Shelton's "Docked For Dinner"
Thomas Blanchard makes gloriously abundant, lush films using colour and texture created from of oil, honey and milk. Galaxies of wonder. My favourite is "Kingdom of Colours". Click play on the top video. Click here to be utterly enthralled. Iris Scott is a professional finger painter. We love silly here at Explore HQ, and what could be sillier than making a career out of finger painting! Love it. Click here for some fingerpainting worthy of your walls! If you have a link you like, please share it with us! You can contact us to let us know. Thank you! This is the section where you can "get your name in lights!" (well at least out there in the internet world!). If you have works in progress you would love to show off, or finished pieces you are particularly proud of, we would love to see them! We especially like to hear about the story behind the creation. This painting comes from one of our fabulous online contributors, Dan Niebrzydowski, all the way from fourth dimension acrylics in Michigan USA. Every painting I do is a major lesson for me. 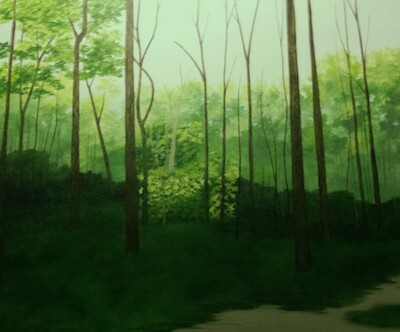 I've been painting nearly five years and have settled on forest landscapes as my favorite. I also enjoy painting single tree “portraits”; that is, a single surreal looking tree alone in a usually surreal environment. There is something calming and spiritual about trees. In any case, being an engineer has forced me to focus on more detail in a painting than most would probably prefer. It's an affliction, and I can't help it. My wife does like it though, so on I go. 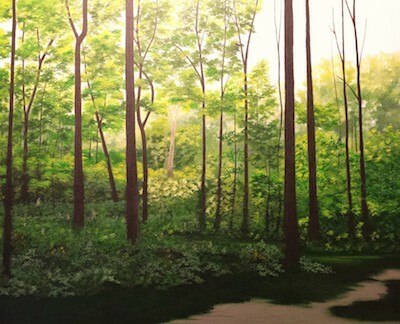 This painting is one of several I have painted from different photos taken at a state park in Indiana. I use photos as a guide and never try to just copy the image, I feel it robs me of creativity. I also try to bring the painting into an evening or morning lighting, as the shadows are always more interesting when the light source is closer to the horizon. I very much enjoy adding bright and colorful accents, which add to the texture. I will start with a very light sky, usually with a touch of gray, sometimes clouds, sometimes no. I like to contrast trees against a light sky, I feel it helps with the overall illusion of depth. One of my main goals is to create depth, and it's a big reason I use the level of detail I do. I will often paint over areas to try to balance the color and shadows, and hopefully provide some level of realism to the work. After I paint the sky, I will usually block in the main chunks of the composition, covering all of the exposed white of the canvas. In the forest paintings, it's a challenge to present the different greens, and I usually change the shades with deep blues, rarely black. 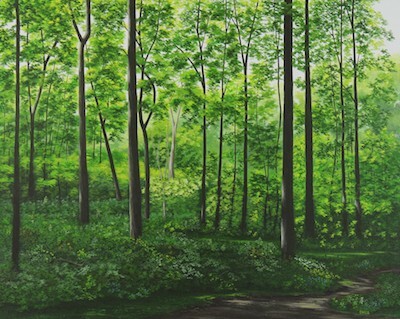 I develop the highlights in the foliage with lighter shades of green, and other colors to create texture. There are always areas to repaint or touch up, as the balancing of the lighting highlights can be challenging. Also, painting bare dirt can be difficult, because the photographed color always seems to look too light in a painting. It might look good in the photo, but I will usually opt for a darker, richer color that complements the surroundings. 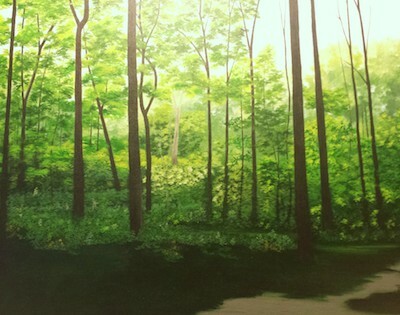 My paintings are typically an evolution, and repainting an area is more the norm than not. I can't count the times I've felt like setting a half finished painting aside, only to push on and be mostly satisfied after. Hope you enjoyed this issue of Acrylics Anonymous! If you have any suggestions, comments or feedback for the ezine or our site, please don't hesitate to contact us. Until next time, make sure you chuck some paint around!